Three suicide bombers attempted early Saturday morning to enter University of Maiduguri, (UNIMAID) but they were thwarted by security men. Two of the bombers detonated their explosives as they faced interrogation by the security men at the gate, killing one of them and injuring another. The third bomber, who had hidden close to a building near the gate, also detonated her explosive. She was the only casualty in the incident. 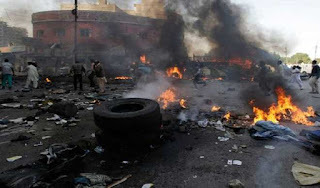 The National Emergency Management Agency (NEMA) based in Maiduguri, confirmed the death of four persons, including the bombers, in a statement on Saturday by Mal. Abdulkadir Ibrahim, the North East Information officer of the agency. “Today at 1:10am, three suicide bombers, two men and a woman attempted to gain access into University of Maiduguri, but were sighted by the university security that stopped them for interrogation. “While interrogating them, the two suicide bombers detonated their explosives devices which injured one of the securities and killed another. “The third suicide bomber hid close to the vicinity of a building in the university later detonated her explosive which affected the structure of the building with no casualty. 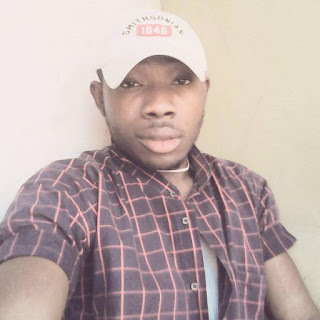 “The injured has been taken to University of Maiduguri Teaching Hospital after administering of first aid while the corpses were deposited at Borno specialist hospital,’’ Ibrahim said. 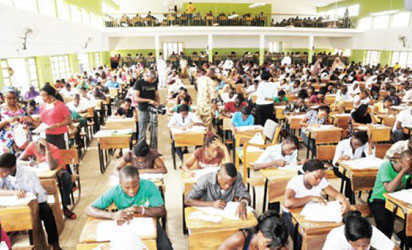 The multiple blasts later delayed the commencement of the Computer Based Test for Unified Tertiary Matriculation Examination at the school. Six centres for 4,000 candidates were embedded in the university. NAN reports that the six test centres in the university recorded low turn out following the incident. Mrs Kaka John, a JAMB staff, said that the exam did not commence on time because of the early morning bomb blast, which made many candidates to stay away. ” Also, the security agencies did not also show up on time because many of them had moved to the scene of the blasts. Also the NSCDC did not show up on time,”she said. Haliru Umar, The JAMB Supervisor, at the ETC Centre one and two said that about 4,000 students would be sitting for the exam in the centre. “In this centre this morning, we started with about 250 students. We still have about 17 more sessions for the exams. ” So far, the exercise was very successful as some of them have started coming out. “We have taken good security measures by providing sufficient security to protect the students to enable them write their exams successfully,” he said. Halima Isa, one of the Candidates said she wrote the test in fear but said it was successful.